In the Group Heading, “Miracles and Godmen” under chapter head “Godmen” a beautiful narration of Avatar hood is given by Mr. M. N. Rao. (Please see page No.114 and 115). I shall now reproduce an extract. “Sai is the name from northern India and might have had its origin in Persian Language. The term Baba is an endearing term, common in the north and used for accosting an elderly person, father or a Guru. The term, Sai Baba became familiar perhaps only during the days of Shirdi Sai Baba. Sathya Sai Baba gives the true meaning of Sai as mother and Baba as Father and Sai Baba mean the universal mother and father combined in one. Shirdi Sai Baba also was considered a Godman, both during his life time and in later years. In the year 1926 was born Sathya, who declared as a teenager that He was reincarnated from Shirdi Sai Baba. As years passed, He revealed that He will continue to be a near centurion and also that a few years after Him, will be born a third incarnation, Prema Sai in Gunaparthi village of Mandhya district in Karnataka. 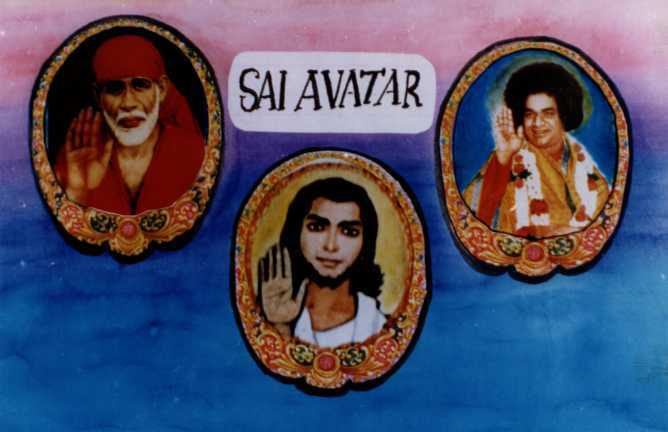 The three divine members of the Sai Baba trinity are a trio of Gods by whatever name posterity might like to call Him. On November 28, 1983 Sathya Sai Baba at Bangalore was in an unusually happy mood. On enquiry from the devotees around, he was reported as having made a significant revelation. Prema Sai’s would-be father was just born on that day and Swami was happy on that account. At an exclusive session in July 1984, Swami had underlined the three-in-one phenomenon of the Sai Baba Trinity. All three have the same Sayeeswara trinity. All the three have the same Sayeeswara Divinity. The first-born is more of Siva, the second of both Siva and Sakthi and the third more of Sakthi. The three are born in remote villages having the same name and also at the confluence of rivulets. Shirdi Sai was born at Parthi at the confluence of a tributary to the river Godavari in Maharashtra. Sathya Sai was born at Puttaparthi at the confluence of Chithravathi and once-existing Kusavathri in Andhra. And Prema Sai is yet to be born in Gunaparthi of Karnataka on the banks of Tungabhadra. I hope that this narration will give more light on the advent of the third incarnation “Prema Sai”.